The Rotating Display Case Is a Very Popular Item. There are Over 4000 Products on This Company's Website. Buy This Rotating Display Case With Confidence. 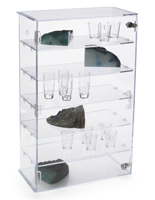 The rotating display case is lockable, so jewelry is safely stored. 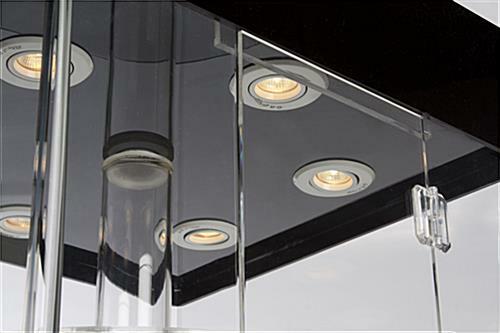 Halogen lamps provide a bright source of light. Six circular platforms give the rotating display case plenty of presentation space. 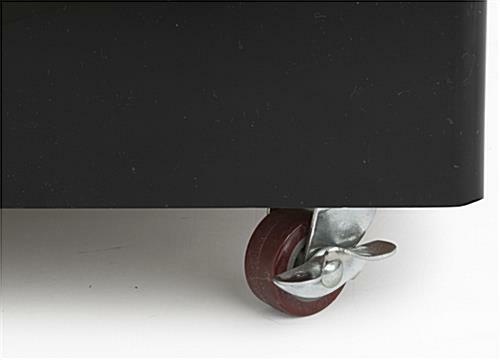 Casters located underneath the rotating display case allow for easy movement to an alternate location. The unit's shelving rotates, so there's no need to walk around when viewing a watch or ring. 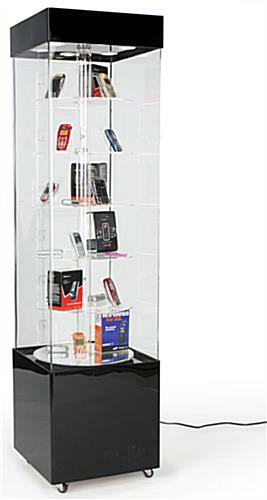 This rotating display case is made from a sturdy acrylic, making it a great alternative to traditional showcases that have a wood finish. These cabinets are manufactured with all the integrity of a higher priced model. Unlike cabinets with a wood finish and tempered glass windows, these plastic units come at a more affordable price point. 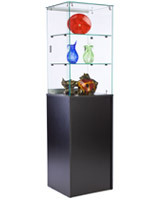 The 72" rotating display case is also lighter than typical showcases of a similar size. The unique feature of this cabinet is the 6 motorized shelves. None of the wood finish models have on the website has this feature! 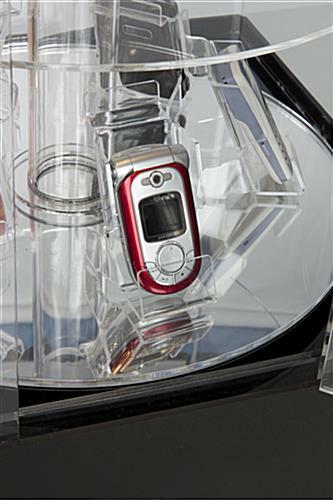 People will be immediately drawn to the spinning objects inside the rectangular rotating display case. Two locking doors keep the items inside safe. 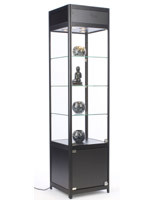 This curio cabinet, rotating display case, is ideal for stores selling jewelry. Each shelf is spaced 8" apart from one another, which allows plenty of room for valuables. 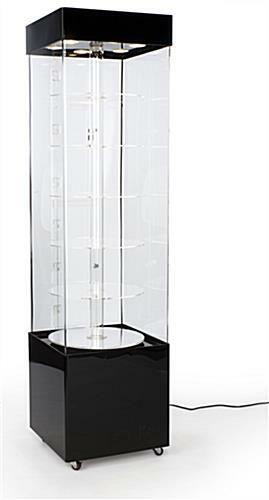 This rotating display case that is 72" high is excellent for showcasing a watch collection. Collectables and other rare items will attract attention once placed inside. 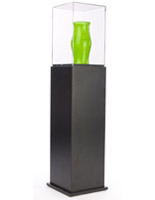 Each rotating display case, like other acrylic cabinets, has top lights to illuminate the interior. The mirrored bottom shelf acts to enhance the lighting. A watch will gleam and jewelry will sparkle. 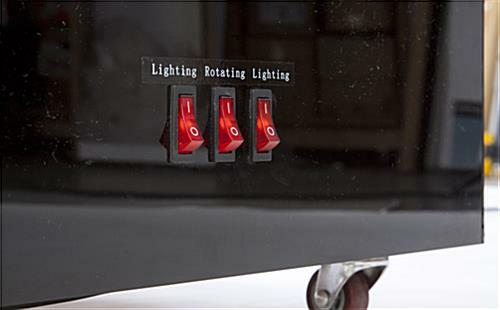 The 20 watt lights in the rotating display case that has two doors can be turned on and off independently from the motor. If merchandise is too fragile, switch the turntable off and the lighting remains on. 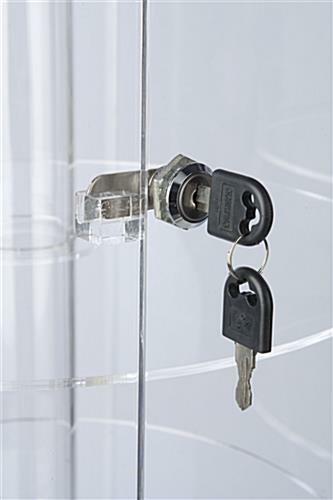 This rotating display case that locks offers security for precious jewelry. Shop owners need not worry about a watch or ring being stolen. Everyone will see that the rotating display case that is lighted has many of the qualities of a wood finish model. 18.5" x 72.0" x 18.5"